Prices vary by breed, but this is how Laurie set her prices for Holland Lops from the former Nature Trail Rabbitry. Learning how to set prices for your sale rabbits can be very difficult, especially when you are starting out. There’s no substitute for experience, but I will share some of my philosophy to give you something to think about. I don’t pick prices for my rabbits out of thin air. There’s an informal system I use to set my prices. I work best when things make some sense to me. And this way of thinking about pricing has worked for me. I’ve placed them in the order that I value them from least to most, but you don’t have to agree with this arrangement. Nor do you need to have the same categories. You may have a 4-H show quality category, for example. Or you might think there’s no difference between a show quality buck and herd buck quality. Your list just needs to make sense to you. So let’s say that we have a brood quality doe and we start her price off at $15. But she’s a sable point so we add a few dollars. She’s unproven, so that keeps the price the same. She’s too young to really evaluate her potential, so we knock a few dollars off for that. She has long ears, more dollars off. But she has wonderful shoulders – width, length, and depth, which is difficult to come by. So we add a few dollars more for the great shoulders. Or perhaps we have a brood buck. 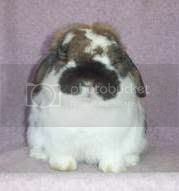 He’s an exceptional rabbit except that he’s a false dwarf and weighs 4.04. So we start him at $10 but add a few dollars for his exceptional conformation. 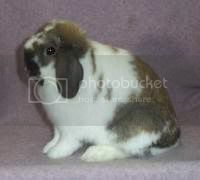 Then we consider that he’s proven and has sired several really nice bunnies. Add a few more dollars. Now we had to this that he carries dilute and the sable gene, and we might add another dollar or two. He’s 17 months old, so he’s in his prime, age wise. He’s a Charlie, so that might bring his price down just a tad, simply because there are fewer people who know how to make the most of a Charlie in their herd. As you can see, there’s still a lot of judgment in pricing a rabbit, even using a “system.” But having a starting place and a list of considerations does help me a great deal. I hope it will help you, too.